A Celebration of EVERYTHING Rhubarb! Are there Rhubarb Festivals in Your area? Everyone LOVES Special Festivities and Events! Just as there are Raspberry Festivals, Strawberry, Peach Festivals, Blueberry, Tomato Festivals, there are also Festivals to Celebrate Rhubarb! These festivals usually include fun filled activities to engage in. From the youngest attendee to the oldest, food festivals are enjoyed by all! These events often include unique and interesting crafts, pageants, food vendors, baking contests, contests for the biggest rhubarb leaf, the longest rhubarb stalk(! ), and more! Learn more about the Rhubarb Plant, collect additional Rhubarb Recipes, purchase Rhubarb Baked Goods, and perhaps participate in contests, and treat the kids to rides! Different festivals have their own way of celebrating the Pie Plant, but one thing is for sure ... they are worth the visit! Whatever make you smile, laugh, or just have a feeling of enjoyment ... that is what Rhubarb Festivals are all about! 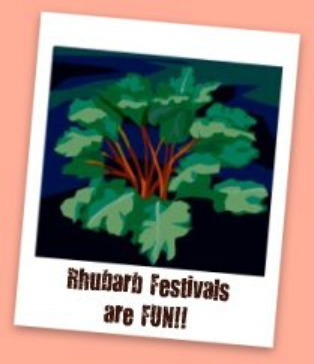 Do you know of a Rhubarb Festival in YOUR area? Do you have a Rhubarb Festival Story? 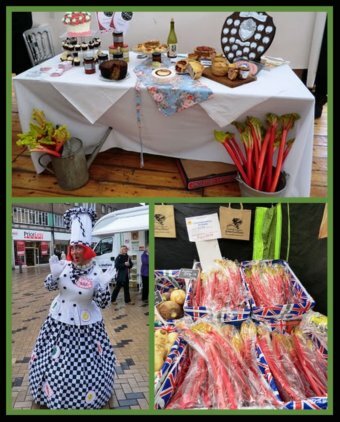 If you have attended a Rhubarb Festival and you are willing to share your experience, and include pictures if you took some, we would LOVE to hear from you! Please contact me via the contact me from, and I will share your story with other website visitors! Here is my Rhubarb Festival Story! Our family had a great day at the Rosy Rhubarb Festival! Check out the link below for a first hand account of our experience! Champlain Valley Unitarian Universalist Society, Middlebury, VT, U.S.A.
Celebrated the first Saturday in June. Manchester, Iowa, USA has a Rhubarb Fest held at the City's Baum Park. For more information, contact the Manchester Area Chamber of Commerce at 563.927.4141. Rhubarb Days was started in 2011 as an early summer event to take advantage of the natural resources and beauty of Osceola. Celebrated the first Friday and Saturday in June.